This is Pixar's first (and probably only ever) princess movie. Rumor has it Disney was the one who wanted the studio to do it. 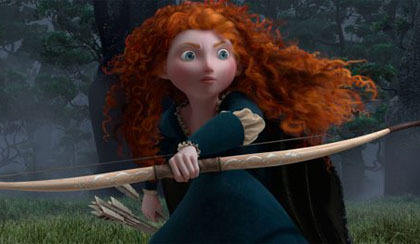 It's still a shame Pixar can't decide for themselves, but nonetheless here we get "Brave" featuring Pixar's very first heroine. It's a ravishing fable that is light, entertaining and just good enough. The problem is that we've come to expect the very best from the studio dishing out the likes of the "Toy Story" trilogy, "Ratatouille" and "WALL-E." They are a prisoner to expectation. Given the task of a princess movie, however, the trio of directors (Brenda Chapman, Mark Andrews and Steve Purcell) give us something lively and fun but also something that feels slightly un-Pixar. The story encroaches on more conventional and traditional territory we'd expect from parent company Disney. Taking place in the Scottish Highlands, the movie is quite possibly Pixar's most visually impressive to date. The rolling hillsides, rushing waters and vast skies are all part of a gorgeous landscape set to a fittingly Celtic score from Patrick Doyle. We follow princess Merida, a girl raised through old lore of being married off and becoming the next queen, like her mother Elinor (Emma Thompson). With Merida's wild red locks and her bow and arrow skills that will bring to mind Katniss Everdeen, she is a charismatic and spirited heroine voiced expertly by Kelly Macdonald ("Trainspotting," "No Country for Old Men"). Merida constantly talks back to her mother because she desires to decide her own fate. Her father, King Furgus (Bill Connolly), is ambivalent to the matter and is more concerned about seeking revenge on the bear who violently took off his leg. In trying to change her destiny, Merida stumbles upon an old cottage which houses a withered old witch (Julie Walters) under disguise as a wood carver. The witch grants Merida a wish, but the spell is not what Merida expects. How the rest of the journey unfolds, however, is exactly what we expect. The narrative is more predictable than we've come to know from Pixar. There's no surprise or spontaneity apparent. Think back to 2003's "Finding Nemo" for a moment. Could you ever tell where those characters would take us? Exactly. Here, on the other hand, it's obvious. What it boils down to is a morality lesson on the complicated relationship between mother and daughter. With a handful of touching songs about mending differences and reaching for your dreams, it's charming and warmhearted yet a bit preachy. Combined with this is a lot of irreverent physical comedy, which often makes for a good time. Merida's younger triplet brothers are especially pesky handfuls of mischief. But when three competing clansmen come to offer their sons' hands to Merida, the slapstick brawls grow wearisome. After the abysmal cash grab and blatant merchandising that was "Cars 2," this latest feature is certainly a step back in the right direction for the studio we've come to love. Still, though, I wish they'd return to their usual ways of giving moviegoers animated adventures brimming with unrivaled originality. "Brave" is good with flickers of being really good, but this is coming from Pixar who otherwise creates masterworks. They're sadly looking more and more like any other animation studio. The first image in Ridley Scott's "Prometheus" is a pale-looking superhuman man who is probably neither human or man. He stands on the edge of a cliff with some sort of spaceship far above him. Something horrific happens to his body, and he's cast into the water below with what appears to be cellular structures forming in the rushing water. Is this place Earth? Is this person or alien where humans came from? Is this showing us our beginning? From outer space? Scott's first sci-fi feature since 1982's "Blade Runner" asks big questions about the origins of humankind. The promise is a deep existential journey with philosophical musings on God and meeting our maker. The problem with this quasi-prequel to his 1979 "Alien" is that the movie poses the questions, but the end result doesn't uphold the initial lofty ambition. In trying to expand his sci-fi classic into something more grandiose, an entire universe of possibility, he actually ends up taking a step back and muddling the story. A spaceship named Prometheus heads toward an unknown planet following the discovery of a prehistoric star map by two scientists. They believe this distant location marks the spot where humankind was originally conceived. One of the scientists who made the discovery is an intelligent and brave woman, Elizabeth Shaw (Noomi Rapace of the Swedish "Dragon Tattoo" trilogy). She's a woman of faith but holds to the notion of a higher life form responsible for creating us. Shaw's boyfriend, Charlie (Logan Marshall-Green), is a fellow scientist who aided in the discovery. Together they get recruited to lead the mission aboard Prometheus, which is headed by a frigid corporate woman, Meredith Vickers (Charlize Theron in ice queen mode much like her role last weekend in "Snow White and the Huntsman"). She represents the company who funded the mission; they're not in it for the discovery, just the money. We could've been satisfied with a top-notch thrill ride in space, but Scott and his writers Damon Lindelof (of TV's "Lost") and Jon Spaihts go for something bigger. This gives the movie a crippling split-personality disorder. On the one hand it wants to be a crowd-pleasing action-packed adventure full of ooey gooey guts galore and gross-out alien creature moments. On the other hand is the Terrence Malick aspirations, a minor version of "The Tree of Life," contemplating where life had its beginnings. Whether you go in expecting one or the other, either way you'll end up unsatisfied. Instead, we get left with an empty feeling of missed opportunity and disappointment. And what more is a feeling of frustration in seeing just how well-produced the whole project is. What's inside the gift wrapping, however, turns out to be less so. You'll still feel like you're getting your money's worth because it sure doesn't look cheap, but the visual grandeur of it all becomes nearly disheartening to see all the wasted potential because it really is a technically profound and awe-inspiring film. The desired scope and sphere of the whole story, however, is never achieved. You may be fooled with breathtaking set pieces and some harrowing sequences of alien action, but these are only temporary distractions from the glaring plot holes, threadbare plot, incoherent narrative and countless unanswered questions. What doesn't fail is the superb acting, most notably from Michael Fassbender as the on-board android, David. He's like a mobile and humanized version of HAL 5000 of "2001: A Space Odyssey." We're first introduced to him as he watches Peter O'Toole in "Lawrence of Arabia" carefully arranging his hair and speaking patterns to imitate the actor. Fassbender's performance here is a thing of beauty. He's restricted by a character unable to show true human emotion yet he uses subtlety to build up quiet menace and wit behind his robot's stiff frame. "Prometheus" does kick itself up a notch in the end, and the last 30 minutes almost forgives what preceded. And if you walk away remembering one scene, it'll be the powerhouse of Noomi Rapace conducting self-surgery with an automatic operating table. It's a visceral and nerve-jangling scene that'll have you cringing and cheering. That moment alone proves this talented Swedish actress is going to have a prolific American film career. Kristen Stewart is painfully miscast in this dark new vision of the Snow White fairy tale. There's a lot going wrong with our leading lady. In "Snow White and the Huntsman," she plays the title heroine all heavy sighs and mouth breathing. It's described that not only is Snow White the fairest of them all, she is also full of heart, energy and spirit -- all things Stewart's performance is not. She flat-out doesn't fit the role, and one must wonder if the actress ever will be able to escape "Twilight" mode. This marks the first feature film from British commercial director Rupert Sanders, and he does deliver on his promise of taking the Snow White legend to its most sinister and harshest extreme. This is a brave re-imagining of the fairy tale, and the exact opposite of earlier this year's "Mirror Mirror." Visually speaking, the movie is a stunner with sceneries that are both bleak and gorgeous. Take the Dark Forest for example full of haunting creatures and deep fog, all which contrasts perfectly with an enchanting fairyland Snow White is later led to. This locale is full of lush greens and woodland creatures no doubt in tribute to Disney's 1937 classic animated film. The film kicks off with a background story about the Evil Queen Ravenna (Charlize Theron) who married Snow White's father only to murder him and gain rights to the throne. This left young Snow White locked in a tower for years with her evil stepmother ruling as a ruthless and maniacal queen hated by all in the land. And now that Snow White is mature, she poses the only threat to Queen Ravenna's rule and requires her dead. All very intriguing, but it's once Snow White makes her escape when the storyline slams into a standstill. What the screenplay suffers from is a distinct slog in pacing. The queen sends out the Huntsman (Chris Hemsworth) to seek out Snow White in the Dark Woods, apprehend her and bring her back to the castle. The strong, mead-guzzling hero swings an ax like nobody's business and upon finding Snow White, he realizes whose side he should be on and decides to help her defeat the queen. There's another man in the tale, as well; Snow White's childhood love named Prince William (Sam Claflin). The love triangle becomes apparent, and yet nothing comes of it. The relationship between any of these pivotal characters is left frustratingly ambiguous to the point of being completely moot. Charlize Theron's snarling, vicious queen is by far the movie's biggest selling point. With a tall, spiked iron crown and ominous gowns, she brings a violent charge to even silent, simmering moments. And while she mostly triumphs, her yelling fits do tend to feel strained. When she asks her precious mirror on the wall -- a cloaked golden figure -- who's the fairest of them all, and it's Stewart over Theron, you can't help but wonder who paid him to say that. This is also a Snow White who's meant to rouse a kingdom to action, donning a suit of armor upon a white steed to lead a charge to the castle. This Joan of Arc replica is all the more unconvincing played by Stewart. And we can't forget our dwarves, eight of them in this version. These aren't the kind of dwarves you'll be expecting, especially once you notice they're played by notable actors including the likes of Nick Frost, Eddie Marsan, Ian McShane, Bob Hoskins, Toby Jones and Ray Winstone. Through the magic of CGI, they are shrunken down to size and put into character. Yet I couldn't help but think how casting these gentleman rid real life acting dwarfs potential work. Isn't that discrimination? If you could take the visual spectacle of "Snow White and the Huntsman" on its own accord, the film would act wonderfully as a breathtaking, fantasy epic poem. But at just over two hours, there has to be some acting and characterization accounted for. It's a harsh lesson both the evil queen and the movie should've took to heart: looks aren't everything.